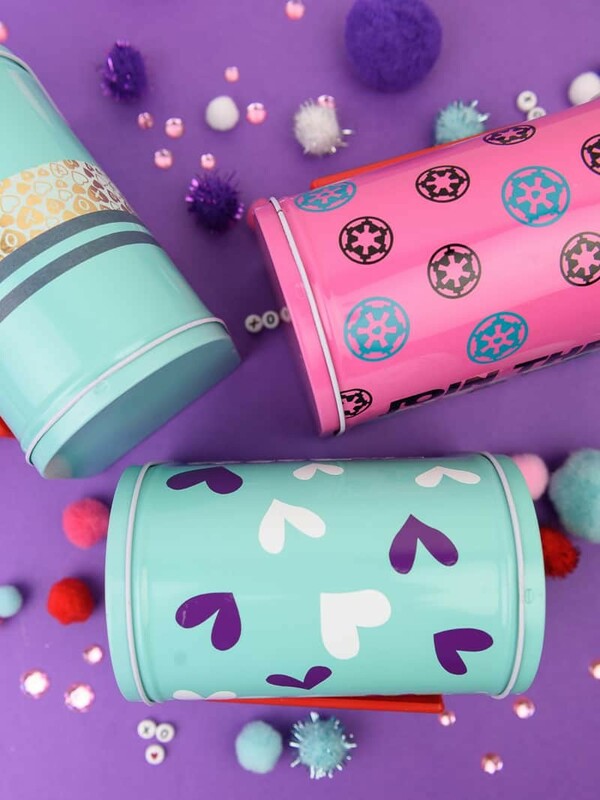 If you need a cute way for your children to collect their Valentine’s from classmates, you can customize these Valentine’s Day Mailboxes from the Target Dollar Spot! Originally I went to Target to grab one of their $1 mailboxes and I ended up being so obsessed with it that I went back for more. And I won’t lie, I’m kind of wondering if I can get away with grabbing a few extras. Not that I need them or anything….but decorating each mailbox has been so much fun and I want to keep doing it! The original plan was to do similar things on each mailbox but then I thought, WHY. Wouldn’t it be more fun to give each one their own design and personality? Um…HECK YES. I really wanted to do one box each for Chris, me and the toddler, but as I got started I totally forgot and used one of the teal/mint mailboxes for myself. OOPS. I don’t think Chris would really appreciate a pink mailbox and even though the toddler isn’t old enough to care I didn’t want to give it to him either. So I just decided to do one personalized box and the other two are just a tad bit different. 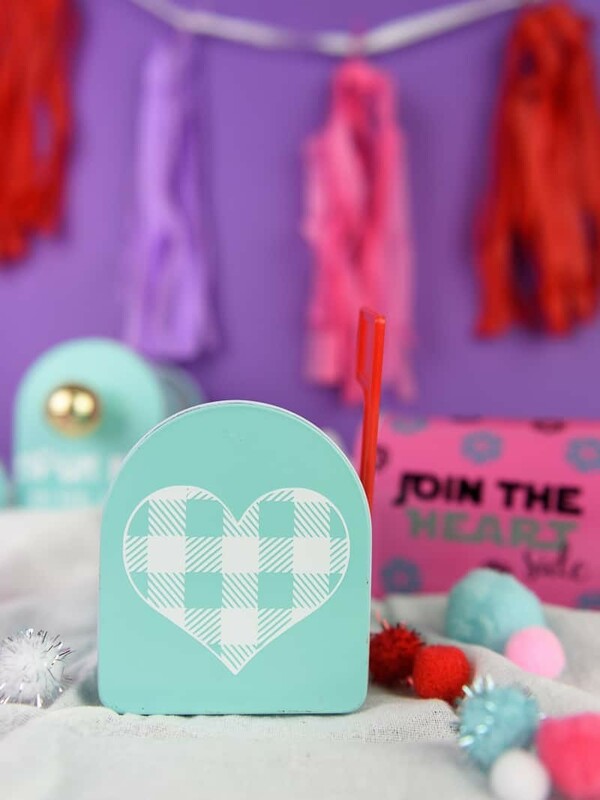 Check out these three crafty ways to decorate Valentine’s Day Mailboxes! Fonts used are Heartland from dafont.com and PN Smarty Pants from the Silhouette Store! Valentine’s Day Mailboxes, 3 ways tutorials! Washi tape, y’all. I was looking for a way to not use as much vinyl on this box and I thought….hey, washi tape might look cool! So I pulled out my stash and wrapped it around the middle of the Valentine’s Day Mailbox. I thought that looked a little plain so I channeled Alice in Wonderland and grabbed an old gold Christmas bulb and hot glued it to the door to make it look like a doorknob. I also used a bit of vinyl to add “open me on feb. 14th” underneath the doorknob (anyone else reminded of the ‘drink me’ bottle that Alice takes?!) to give it a little more decoration. Alice in Wonderland was never one of my favorite movies but this Valentine’s Day Mailbox is just too cute! The second box was pink Darth inspired, and yes those are tiny little hearts inside the Imperial symbol! If you’re going to girl-up the empire you might as well go all the way with tiny hearts and lots of pink everywhere! I also reverse weeded Darth Vader so that he was mostly pink and that the front door wasn’t overpowered by black. It also looks a little more minimalist against everything else that’s going on with the box! The last box might be my favorite…but I may be a little biased since my name is on it. This box is the one I think would go so well with Valentine’s Day celebrations at school because your child could have their own personal box to carry around Valentines in! Seriously, isn’t that the cutest idea? And that plaid heart in the front is my FAVE. I bought the heart from Etsy and I am so excited about it. I need to figure out where else I can put it (maybe on a shirt?)! I know I’ve said this before but I’ve never been a huge Valentine’s Day person. But these cute crafts are kind of starting to change my mind! Really though, I don’t think I’ll ever fully convert to loving the holiday. Part of it has to do with my peanut allergy and the fact that I can’t have a lot of candy. And I’m not really into flowers because they cost a lot and then they die (I’m super cheery about this holiday, huh?). 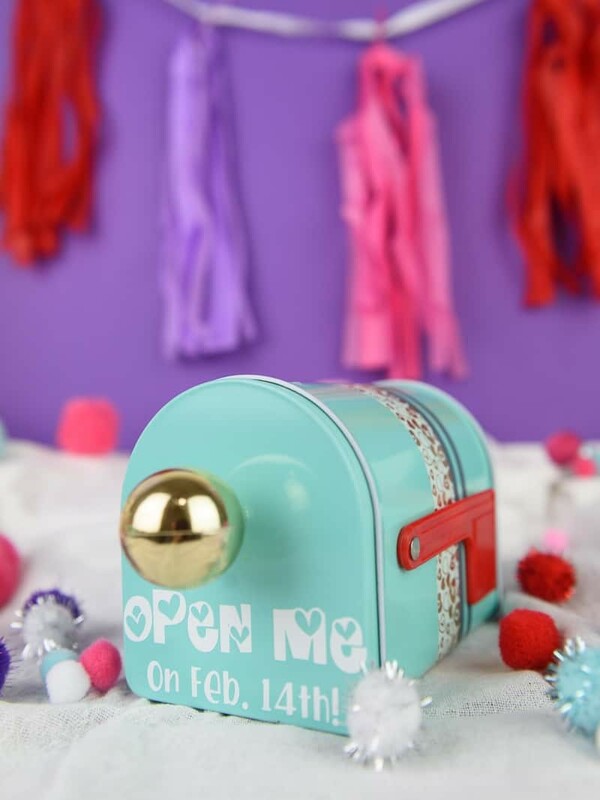 But I am into cute crafts and Valentine’s Day does make way for some cute things like these Valentine’s Day mailboxes that you can make. So hey, I’ll take what I can get!